It wasn't perfect, but Deep Breath was a fantastic return for Doctor Who tonight. Following a series that offered more disappointment than wonder, I really feel Doctor Who could be heading in the right direction for the first time since the fifth season's opener back in 2010. Peter Capaldi is nothing short of an absolute triumph. We're still only getting to know his incarnation, but he gave a near faultless performance as a lost Doctor who knows less about himself than he does the people around him. From his delightful pyjama-wearing horse-riding, to his more sinister moments in the episode's crescendo, he nailed every scene with ease. Matt Smith, for me, won't be an easy act to follow, but Capaldi is certainly on the right tracks. Also, as surprising as it is satisfying, Clara finally became a character this evening, rather than a mere plot point to allow an episode to cheat its way to a conclusion. She's still considerably weaker than other companions we've been treated to, but this feels like a fresh start for her. Coleman, too, gave a terrific performance. As for the plot? This is where the episode struggled. 75 minutes was far too long anyway (60 would've been perfect), and nothing really happened for the first half an hour. It gave the characters some calm time to talk, but the pacing fell apart early on and struggled to pick itself back up again. That said, the "Deep Breath" sequence was terrifically executed, and the T-Rex was beautifully animated, if fairly irrelevant to the plot. But when we're being introduced to a new Doctor, plot must come second. Moffat balanced plot and character fairly well throughout the episode, there was just too much filler in a story that didn't need to be as long as it was. The actual standalone plot of the episode wound up as the most uninteresting thing here, but when Capaldi was such a great presence on-screen, that can hardly be criticized. I was hoping for a simpler, yet darker, more assured series of Doctor Who, and if Deep Breath is anything to go by, they may well have done just that. A Dalek turned good was always going to be an interesting premise for Doctor Who. Undeniably the most infamous villain the show has ever produced, the Daleks are so conventionally evil that turning one good would either wind up as a complete and utter success, or a catastrophic fail. Thankfully, Into the Dalek lies very strongly with the former. I'm personally not a fan of the Daleks. To me, they are loud, shouty, screechy tin cans with hardly any redeemable qualities. So if, like me, you were beginning to feel the Daleks were becoming a little tired, then this episode could just start to change that perspective. Into the Dalek is, arguably, the greatest Dalek story since, well, Dalek. What was so strong here was how different this episode felt from the offset. Even before we went inside the mind of the Dalek, the introduction of soon to be recurring character Danny Pink (a presumable love interest for the ever improving Clara) was smartly handled. It is already clear that he isn't like his male counterparts from other recent series'; a soldier-turned-teacher, he has a history behind him that, if handled appropriately, could make him an interesting and well mapped character. I look forward to seeing more of him in upcoming episodes. Capaldi shined through even stronger here than he did in last week's opener Deep Breath, in an episode that was more tightly plotted and suitable for its run time. The plot moved along at an admirable pace, the action and the dialogue were evenly spread, and the tension peaked at exactly the right times. In terms of pacing and story, this was pretty good stuff. But what really set this episode out from the rest (so far, at least) was how focused it remained on the character of the Doctor amidst the action and occasionally dodgy CGI. After first coming face to face with the broken Dalek, he questions Clara "Am I a good man? ", to which she responds, as the viewer surely would, "I don't know". Since that moment so early on in the episode, you can feel this motive empowering every move the Doctor makes. He spends a lot of time attempting to work out the answer to this question, but by the time the credits begin rolling and the episode has concluded, the answer remains as open as ever. "Am I good man? ", the Doctor asks. "I don't know, but I know you try to be" Clara answers. Capaldi's Doctor may be unsure whether he is a good man, but he is an incredible Doctor, in what is shaping up to be potentially one of Doctor Who's very best seasons. Episode three's have been fairly hit or miss in terms of Doctor Who's history since it returned in 2005. Episodes such as Gridlock or School Reunion played out as smart character studies, but maintained the entertainment level you'd expect from something so early on in the series, whereas other episode three's like Victory of the Daleks and The Curse of the Black Spot remain all-time low points for the show. This is, in some ways, understandable. We've been introduced to the series in the first two episodes, and it's too early to throw anything too dramatic in just yet, so where does this leave us? Robot of Sherwood is a real mixed bag of an episode. It's good fun, and by no means a bad piece of television, but it lacks that conviction that made the first two episodes of series 8 such a treat. It's enjoyable enough in the moment, but fairly likely to wind up as the most forgettable episode of the series. In terms of character, everything introduced in Deep Breath and Into the Dalek is maintained here. Despite Robot of Sherwood being played out, for the most part, as a comedy, Capaldi's doctor retains his more serious attitude in the pivotal moments of the episode, but also gets a chance to show his versatility as an actor in terms of comedy. Coleman is great too, and is truly developing as an actress whilst Clara develops as a character. She might not have the emotional weight in this episode that she made use of in the first two, but she suits the more light-hearted tone well. Guest star Tom Riley is also solid as Robin Hood himself, if just a little over the top in moments that don't really need to be, but the three leads here have great on-screen chemistry that makes this episode consistently enjoyable, even in its weaker moments. Where Robot of Sherwood faults, however, is in terms of story. Whilst this episode was played out as a comedy, it lacks a plot to move the characters from scene to scene. It takes about twenty minutes before we really learn anything, and even then it's more superficial than anything else. I get that writer Gatiss aimed for a more light-hearted outing, but not enough really happens throughout the 45 minute run time to leave us satisfied by the conclusion. This wouldn't be all bad, though, if the episode was also used to develop and analyse the character of the Doctor, but rather than develop the Doctor any further, Gatiss just relies on everything show-runner Moffat has already done for him. Robot of Sherwood wasn't a bad episode, but by far the weakest of the series thus far. It's good fun in the moment, and is certainly better than some of Gatiss' other episodes, but it is, unfortunately, set to be forgotten by the time the title sequence rolls for next week's episode. I feel I need to start this off by stating that I am a big fan of Moffat's era of Doctor Who. I am aware that he doesn't always get it right, but then again, neither did Russell T. Davies during his stint as show runner (farting green aliens, anyone?). When Moffat gets it wrong, it does begin to fall apart. Maybe the pressure of entire story arcs is too much, or maybe his ideas are too big for the show. Either way, let's examine his episodes before he became show runner. The Empty Child/The Doctor Dances, The Girl in the Fireplace, Blink and Silence in the Library/Forest of the Dead are all considered some of the best episodes since the show's revival in 2005. So now, for the first time since the third season, Moffat has written a standalone episode, not relating to a plot arc, that doesn't act as a season opener of conclusion of any sorts. And, just as you'd expect, it is nothing short of a masterpiece. Moffat is an expert at crafting fear in a script, and Listen was no exception. The idea of playing on a nightmare "that everyone has" could have been risky, but Moffat plays it out with perfection. Much like most horror, fear comes from the unknown. In this case, it is the idea of something, or someone, hiding under your bed whilst you sleep. Listen doesn't really follow a basic plot structure, there is no defined beginning, middle or end. But it's all the better for it. Stripping the episode of a basic structure allows it to feel more natural, which, in turn, makes the horror increasingly effective. Almost the entire first half of Listen is played solely to evoke fear in the audience, and it does its job perfectly. Capaldi is, yet again, even stronger here than we've seen him before; there's a strong possibility he will be everyone's favourite Doctor by the time Series 8 comes to an end. Coleman is incredible here, too. I went into Series 8 loathing Clara, and now she's becoming one of my favourite companions. Her character has developed so nicely so far, I hope this gets continued. But where Listen truly excels is in the direction it takes in the final fifteen minutes. The level of emotion and weight to the story spontaneously deepens, and whilst all suddenly becomes very clear, it simultaneously wraps up perfectly, with a conclusion so powerful it could rival 2006's Doomsday. There isn't really anything sad here, but the dialogue for the entire barn scene, matched with some clever tie-ins with previous episodes, makes a beautiful ending to a beautiful episode. Listen was perfect in every respect; the direction, the writing, the acting, the tone. This is exactly the kind of tone that Moffat should focus on more. As stated at the beginning of this review, I am a huge fan of Moffat's work on this show, and this was no exception. Listen is highly likely to be the best episode of the series, and will potentially go down as one of Doctor Who's very, very best. "The Doctor robs a bank". The idea sells itself, really. But Time Heist was never going to be that straight forward. The result is an episode that remains action packed and fun throughout, but all feels a bit too familiar. Doctor Who is infamous for its use of running, especially down corridors; Time Heist is essentially a corridor running montage for its entire middle act. But the idea keeps it interesting. The episode is also boosted by, yet again, great performances from Capaldi and Coleman. Here, we were also taken away from all the story arcs and serious questions posed so far; a necessary break, which allowed the episode some breathing room. Without this, Time Heist could have been the biggest misfire of the series. But, thankfully, we were left with an episode that, whilst overstuffed and repetitive, was consistently fun and engaging enough to act as a solid piece of TV drama. The 45 minute time restraint is sometimes Doctor Who's biggest burden, but never more so than here. Time Heist has so many ideas and so much to tell, it struggles to fit everything in, which results in the first half of the episode feeling cluttered and choppily edited. It wouldn't surprise me if the rough draft of this episode was well into an hour long. I actually think Time Heist would have worked as a two-parter. This first half could have acted as a set up (which is, inevitably, needed; they are robbing a bank, after all) and only just delved into the action towards the end, with the resolving part acting as an extended version of the episode's final half. By the time the episode ends, and with so much thrown at you in the final ten minutes, the previous 35 all felt so rushed that it doesn't really make sense. This might improve upon repeated viewings, but even then, the ending felt a bit familiar. Did the whole Alien Love Story thing remind anyone else of last year's Hide? But, Time Heist probably winds up as the series' most overall enjoyable episode thus far. This was a perfect example of how to have fun without resorting to silliness, which is where Robot of Sherwood faulted. It was also nice to have some side characters that were a bit more fleshed out. Both Psi and Saibra were well developed and welcome additions to the cast; I only feel they could have been even stronger has this story been split over two episodes. This also applies to the episode's antagonist; Ms Delphox, played brilliantly by Keeley Hawes. Whilst she was certainly a creepy villain, she wound up too formulaic in the Female Villain role, and her motives weren't explored enough. Whilst there does seem to be a lot of criticism here, I still really enjoyed Time Heist. It was no match for last week's masterpiece, but it wasn't the show's weakest episode this series, either. Its ideas were too big for its runtime, and there were minor character issues, but it was entertaining, funny and action packed enough to remain interesting throughout. It just won't top any fan favourite lists. 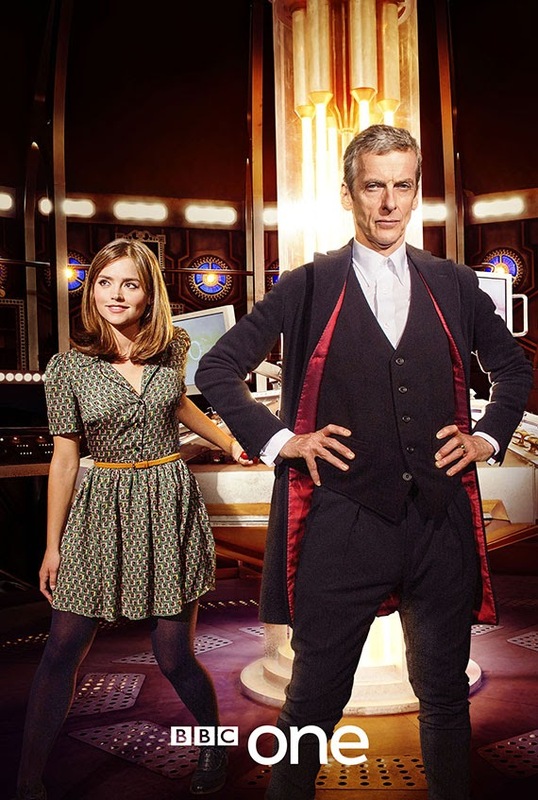 The Caretaker is very likely to wind up the biggest surprise of Doctor Who's eighth season. What could have been a boring rehash of previous episode (on paper, this is The Lodger crossed with School Reunion) was elevated into one of the shows' funniest, most down right entertaining episodes in years. Whilst this year's Robot of Sherwood tried its hand at comedy for almost its entire runtime, The Caretaker was far more successful in just its opening act. But amongst all this comedy lay potentially the most character development I've ever seen in one episode of Doctor Who. The Doctor, Clara and Danny have all been developed nicely over the course of the series thus far, but The Caretaker alone advanced them brilliantly. And, on top of all of this, we were treated to a simple, time travel free story and a brilliantly effective monster. The Caretaker delivered on all forms. Amid all the nice character work done here, the plot bounced along nicely, reaching a satisfying conclusion with the return of Missy and the Promised Land. It's obvious that this recurring setting will come into play come the series finale, and hopefully it will pay off. The Skovox Blitzer may not have been the greatest villain Doctor Who has ever produced, but it fit well with the episode and gave the characters enough to do to perfectly sustain the 45 minute runtime. While last week's Time Heist felt a bit cluttered, this plot was weighted faultlessly. Overall though, The Caretaker, while not as emotionally strong as other episodes this series, was probably the most enjoyable. It was a perfect example of pure television fun, executed well, and with some fantastic character work running at its core. Doctor Who will always have its naysayers and people who criticise the show for their respective reasons, but, for me, The Caretaker was another great episode in what is very likely to be an incredible series. The final six episode reviews will be posted here.